The rolls really well. Used but in good condition. MEGO Pocket Comic Action Heroes Spider car Spiderman and Hulk - Box. Condition is Used. Shipped with USPS First Class Package. Rare set - cello holding Spiderman and Hulk loose but there. Box is in beat up shape but super rare none the less. Questions - ask. Other MEGO items available. Net and wing, etc, included and never used. Payment expected in full within three calendar days. Please do not bid if you do not intend to pay - thank you. Condition is ORIGINAL. FACTORY STAPLED/SEALED WITH ULTRA RARE CATALOG, THESE DID NOT. Good overall condition. See pictures for details. I will do my best to make sure you are satisfied. It is in very good condition and doesn’t have any cracks or breaks. It is missing the steering wheel and looks like it was either never played with or taken care of very well. Mego Batman Pocket Super Heroes Mego 1979 Unpunched graded 75 subs 75,80,85, still in afa wrapping newly graded from afa nice item card has a vein on it in lower right corner which gave it the 75. The bubble is clear with no dents or dings it’s very nice, at an 80 subgrade the figure it also mint as well with an 85 subgrade there also isn’t any rub inside the bubble from the figure either, this is truly a nice piece thanks for looking! Even the mouth area attaches to the Face. Not sure of the year or the origin of manufacture. We also provide other products aside from toys, such as jerseys, collectables and music gear. VINTAGE 1975 MEGO POCKET HEROES JOKER 3.5” JACKET ONLY DC COMICS. Condition is Used. Shipped with USPS First Class Package. Please see PHOTOS. Up for Auction is 1975 Hulk figure. Shows some use but not bad. Thanks for Viewing and Happy Bidding! Bubble is sealed with except a small amount is loose under his feet. Dent free. Bubble is fully sealed and dent free. For sale is a 1979 Mego Pocket Super Heros Spanish Card EL Incredible Hulk sealed. Incredibly rare. Package has great color as shown and figure is obviously perfect as he has never been removed. Bubble is fully sealed but may have some minor imperfections as shown. Please examine all photos carefully and be sure to email me with any questions. Thanks for looking! Every thing is in nice shape with minor play wear. Quarter in Picture for scale. This is a piece from my archive of high grade toys. It comes from a toy store that closed in Brooklyn, NY in 1986. IT was back stock. 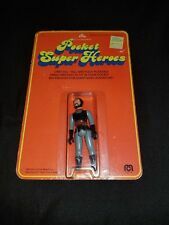 I had a full case of these MEGO pocket heroes and this is one of my few remaining case fresh, mint, glossy, unpunched figures. Minor dent in bottom of card shown!!! It is certainly investment grade! It will meet all AFA criteria for a solid grade. Clear bubble, unpunched. Face/cowl and body parts are all in excellent condition. The card is far from mint. Spiderman bubble has been reglued. Crease across the card just over bubble. Part of cardboard missing at top from removal of price sticker and on right side of bubble. Overall displays nicely but does have issues as listed and pictured. GREAT SHAPE OVERALL, SEE PICS! Overall display is very good factoring in listed and pictured defects. 1979 Mego Pocket Heroes DC Comics Red Backing Card! Batman Superman Shazam! 1979 Mego Pocket Heroes DC Comics Red Backing Card! Batman Superman Shazam! Please see pictures for details. We combine shipping. 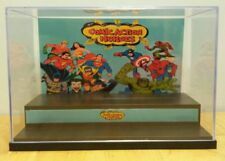 Be sure to follow us and check our other listings for more great vintage DC Comics toys, video games, and merchandise. THANK YOU! Marvel Incredible Hulk. Three pocket heroes, these are either 4" or 3.75". HULK is rare with original stand and no paint wear. Vintage Mego Pocket Super Heroes Batman Action Figure Used Loose Sitting Rare! The item for sale is the vintage figure pictured above. It is sold as shown. Please ask any questions. Bubble is in very good condition and is not scuffed. ANY LINES, SPOTS OR GLARE IS FROM THE SCANNER LIGHT OR GLASS AND NOT ON THE CARD.